freshness for as long as possible. 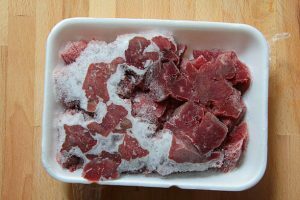 According to the Food Safety Government foods can be stored in a freezer at a constant temperature of 0°F or below and can be kept indefinitely. Those foods may be safe to eat indefinitely but the quality of the taste will reduce after 4-12 months due to freezer burn, etc. unless vacuum sealed and flash frozen at negative 50 to 70 degrees Fahrenheit. The best way to store these foods is in airtight containers and/or blast freezing and vacuum sealing. Vacuum air tight containers or freezer bags help reduce freezer burn while retaining flavor, this is best for baked goods, stews, leftover meals that will typically be thawed in a couple of weeks or at maximum a couple of months. Blast freezing and vacuum sealing is a method that can be used mainly for meat, seafood, poultry and vegetables. This also helps retain the flavor and reduce freezer burn in foods in their raw form. There are several companies that package their foods with this method, if they go on sale stock up because they will last the longest and retain the most flavor and nutrition. The best place to find companies that use this method of packaging and sell all-natural or organic food is go to The All Natural Food Council of North America (www.anfcna.org) and find the company closest to you. Stocking up a freezer full of quality meats, leftovers, vegetables and fruits is a way to avoid food waste and to stick to a moderate food budget.